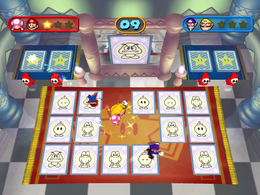 Cardinal Rule is a minigame in the game Mario Party 7 and is a 2-vs-2 minigame. The term "cardinal rule" is used for the most fundamental and important rules in a code of conduct. Four Shy Guys toss the cards onto the carpet. Both players on two teams have to Ground Pound the card that matches the card shown in the center of the screen. However, many cards can be variations of one card. For example, there can be a Bob-omb, Koopa Troopa, and Goomba card in a normal variation or a sleeping variation. The first team to get three pairs wins the game. Rules – "Look at the card in the center of the screen, then Ground Pound the matching card pair." Advice – "The first team to win 3 times takes the match. Watch out, however! Many cards look alike." This page was last edited on December 20, 2017, at 10:20.